The Notch signaling pathway is an evolutionary conserved system that is involved in intracellular communication. Notch receptors play an important role in development and cell-fate decisions. Notchless is a loss-of-function mutant allele that encodes for protein NLE1 (notchless homolog 1). NLE1 is a 485 amino acid WD40-repeat protein that binds to the cytoplasmic domain of Notch, regulating its signaling activity in Drosophila melanogaster and in mice. Deletion of the NLE1 gene in mice during the early stages of development results in embryonic death, while gene deletion in the late stages of development leads to activation of a caspase-3-dependent apoptotic pathway.In plants, NLE1 is crucial for normal cellular growth and development. Underexpression during shoot proliferation causes pleiotropic defects such as delayed flowering and abnormal organ maturation. It may also play a role in 60S ribosomal subunit biogenesis in yeast. NLE1 contains eight WD40 domains and produces one isoform due to alternative splicing. 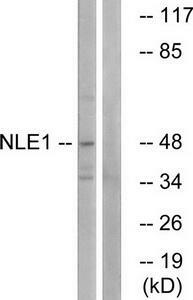 Western blot (WB) analysis of NLE1 antibody (Cat.-No. : AP01490PU-N) in extracts from COS cells. Western blot analysis of extracts from COS cells, using NLE1 Antibody. The lane on the right is treated with the synthesized peptide. Western blot analysis of extracts from COS cells, using NLE1 antibody.The lane on the right is treated with the synthesized peptide.